I am writing to give my sincere thanks to Antiphon for the generous donation of £1,000 raised at the Christmas Concert in aid of West Northumberland Food Bank. Please pass on my thanks to everyone involved in organising and performing, it was such a wonderful heart warming event. During the last 12 months we have met 2,194 requests for help and distributed 3,645 bags of food and essential household items, and 181 Christmas Hampers to 393 households with 526 adults and 316 children. So often people in hardship have nowhere else to turn for support and most people who come to the Food Bank are deeply ashamed to ask for help, and feel very alone with the problems they are facing. Very often people who turn to us for help are overwhelmed with the generosity of local people who donate food and money. I can assure you that this gift will help us to make a real difference to the many people and families across West Northumberland who come to the Food Bank. 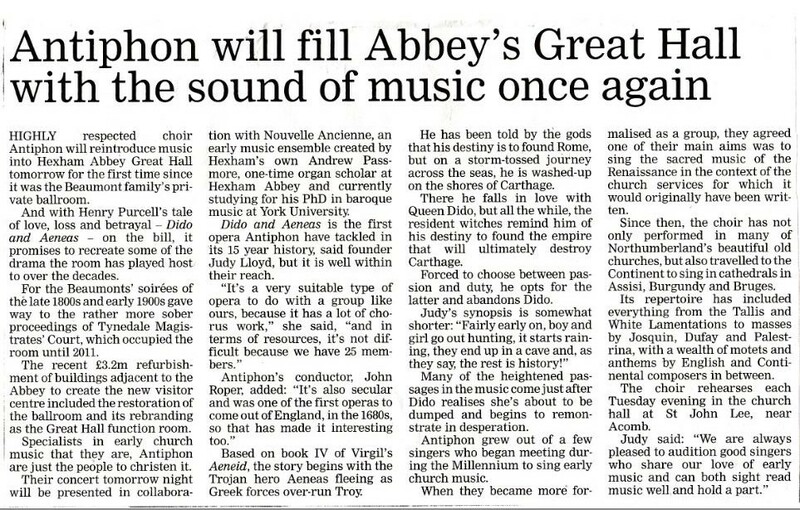 Following on from their highly acclaimed concert “Ye Gods” performed earlier this year at Aydon Castle, it was the turn of St Giles Church, Chollerton to be the venue for Antiphons latest musical journey through history. Entitled 'In a strange land' it was a very apt title for this concert which is a quote from psalm 137, the whole sentence being 'How shall we sing the Lord's song in a strange Land'. It must sum up only too well the feelings of so many composers for most of the 16th century. As kings and queens came and went they each imposed their religious convictions, with greater or lesser brutality, on a confused population. It is a tribute to the genius of Thomas Tallis and William Byrd that they survived and contrived to please so many monarchs. This programme of music reflected their changing responses to the succession of rulers they had to serve. One can readily see why they survived as their music is unfailingly beautiful. The pieces we heard in this concert were presented with great sensitivity and passion by Antiphon, under the guidance of their conductor John Roper. Each piece performed was memorable but a few will stay with me for a long time. One was the Missa 'Puer Natus Est' by Tallis, a most lovely work which I would be more than happy to hear in its entirety rather than just two sections; another was the anthem 'Teach me O Lord' by Byrd, beautifully sung by a small group of five from the choir; and perhaps most of all the anthem 'Ne Irascaris Domine' which conveyed the heart-rending sense of desolation which Byrd and Tallis must have experienced as they saw England pushed away from what they saw as the true faith into a desert of Protestanism. All in all an evening to remember. Hexham Abbey was the perfect choice for Antiphon’s performance of Monteverdi’s monumental Baroque masterpiece, the Vespers of 1610. A challenge to choir and soloists alike. It’s said that the work was his CV aimed at securing a transfer from the court of Mantua to St Mark’s in Venice. True or not, it worked. He got the job and stayed there for the rest of his life. The 12 vespers run the whole gamut of styles and emotions from the deeply devotional to the frankly operatic, held together by a plainchant cantus firmus which weaves its way throughout the work. The choir, led by John Roper, rose brilliantly to the challenge; there’s not a weak section among them and their enthusiasm was obvious. They were supported by seven equally inspiring soloists. The chamber orchestra Nouvelle/Ancienne was led by former Abbey chorister and now Doctor of Music Andrew Passmore. While we didn’t have the lutes, viols and sackbuts of the 1610 version, we did have lots of candles and an organ which emitted a strange red glow. The work opened dramatically, if rather stridently, on two trumpets high in the organ loft with a theme from Monteverdi‘s opera Orfeo, recycled presumably on the principle that if you’ve got a good tune you should make the most of it. There were too many memorable moments to mention, but the sensual love duet for sopranos, Pulchra es, and the tenor duet where one singer echoes the other in Audi coelum, stand out. The vespers end as dramatically as they began, with a reprise of the Orfeo trumpet tune in this performance. A cold evening, a full house and a performance that made it well worthwhile to leave the comfort of the hearth. DELICIOUS! I could actually end the review of Antiphon’s latest concert right there, but why miss the opportunity to rub salt in the wounds of those who missed out? For the evening in 13th century Blanchland Abbey was as charming as they come: lashings of sweet music in an atmospheric setting, topped off by strawberries and Pimms. Yum! Established by local historian and accomplished songstress Judy Lloyd and directed by John Roper, the Hexham-based chamber choir specialises in English and Continental music of the Renaissance and Baroque periods. While they tend to roll out their more heavy-duty performances at their winter concert – the first choir to perform in Hexham Abbey’s newly instituted Great Hall in February, they presented Monteverdi’s Lamento d’Ariana and Purcell’s Dido and Aeneas on that occasion – their summer concert is an altogether lighter affair. Three French madrigals, seven of the 11 songs from the folk songbook The Sprig of Thyme (arranged by John Rutter) and a sprinkling of beautiful middle English songs followed, not forgetting a strong rendition of Gershwin’s Summertime by soprano Mary Emmett and violin solos by Louise Khazaee. The only blot on my otherwise lovely evening was the inclusion of Benjamin Britten’s Five Flower Songs. Am I the only person who can’t get away with that man? Denis McCaldin Director of the Haydn Society of Great Britain and Professor Emeritus of Music at Lancaster University. “Remember me, but ah! forget my fate”. The final words of Dido as she goes to her death, set to heart-wrenching music by Henry Purcell, and sung by soprano Sarah Holland accompanied by four stringed instruments, moved many of us in the audience to tears. It was the end of Dido and Aeneas, performed by Hexham choir Antiphon, directed by John Roper, and the instrumental and vocal ensemble Nouvelle|Ancienne, led by Andrew Passmore. The decor, muted pastels lit by candelabra, reinforced the atmosphere. We were in the Great Hall in Hexham Abbey, formerly the ballroom of the Beaumont family and well-designed for chamber music. This was the first musical performance here for over 100 years: the music, by Monteverdi and Purcell, was an inspired choice. The small numbers of instruments were easily heard, as was the choir, whose greater numbers occasionally sounded just a little too strongly in that space. The concert opened with four of Monteverdi’s madrigals, written for the lost opera Arianna (Ariadne), but fortunately surviving because he published them separately as Lamento d’Arianna. Ariadne, abandoned by Theseus on the island of Naxos, sings of her misery, begs him to return, then in a rage asks the wind and waves to drown him, only to retract her words in the final madrigal. The extraordinary poetry by Rinuccini was a gift for Monteverdi, whose five-part setting ranges to all extremes, making hard work for singers. The choir performed these beautifully, accompanied by Andrew Passmore on the harpsichord. A musical leap forward of 80 years took us very firmly into baroque territory with Purcell’s Dido and Aeneas, his first opera, written at the age of 28. The four string-players (Nick Chen and Jenny Bembridge, violins, Lucy Dearn, viola, Sam Stadlen, cello) at once established the mood and we were soon enjoying the solo voices of their colleagues Sarah Holland (Dido), Edd Ingham (Aeneas), Nia Passmore (Belinda) and Zoe Buxton (Sorceress). The other solo voices, all excellent, were drawn from choir members Hilary Dawson, Pip Emler, Alice Brunton and Tom Emmett. The choir sang their substantial chorus part well, and Purcell’s skilful setting of Nahum Tate’s libretto took us rapidly through the narrative of love and desertion. It was a longer journey from passionate love to abject despair, but strikingly similar to Ariadne’s. Aeneas abandons Dido when a messenger from the gods (engineered by the Sorceress) commands him to depart for Italy. His last-minute attempt to flaunt the gods and stay (well-portrayed by Edd Ingham) is rejected by Dido in the most dramatic exchange of the opera: “I’ll stay” - “Away, away” - flung back and forth by the singers. The final, famous lament by Dido, “When I am laid in earth” is Purcell at his finest. This first musical performance in the restored Great Hall was a credit to Antiphon and Nouvelle Ancienne. We hope for many more good things to come in this place. The concert in St Mary's Church on Holy Island on Saturday July 20th was very moving and a fitting finale to your week's work with us. The words and music and the wonderful voices of the soloists and Antiphon in the dramatisation of the story of the early Christian Church in Northumbria was a wonderful conclusion to our week. It was an occasion which will remain in my memory for many years. With many thanks for your work and inspiration. Both the rehearsal and the concert were hugely enjoyable. We felt the rehearsal was well organised and well supervised giving us plenty of opportunity to revisit the walking songs we had practised on our walk. The venue was superb and very fitting for the story to be told. The concert was remarkable and took us all by surprise. Songs, readings, story, costumes were breathtakingly good. We all felt that it was a brilliant end to a very special week. We agreed that the concert could easily have been performed at Hexham Abbey or even better Durham Cathedral. Whilst this would have been a lot more work we felt that the excellence and professionalism of the choir and performers would have guaranteed further memorable performances. A Small Bright Light in Winter Darkness. We all know it can be pretty miserable in the northern hemisphere in the weeks after Christmas. 20th January was meant to be the most depressing day of the year and spring seems a long way off. If we think it’s bad now, when all we have to worry about is how long our low energy light bulbs take to warm up, you can understand how dark and depressing it must have been to rely on the light of one candle, or a tallow lamp in centuries gone by. It doesn’t take much imagination to understand how rituals of light and fire must have been both practically and spiritually essential to help peasants and nobility make it through to the months of summer light. These traditions quickly built on as Christianity spread from a nice warm Middle East, to damp, muddy and cold climes of the north. All this served as inspiration for the Antiphon concert ‘Lux aeterna’ (eternal light), at St Andrew’s Church, Heddon on the Wall, directed by John Roper. The concert presented a varied programme of words and music, reflecting on Candlemas and the formal end of Christmas, combined sensitively with reflections on the tipping point between winter solstice and spring equinox, and the hopes for spring that echo our more pagan past. The venue of St Andrew’s Church provided a small but perfectly sized and authentic venue; consecrated in 690AD, the site and church would very likely have played an active part in transforming old rituals of winter into the new religion. The friendly venue, although small, formed the perfect setting for the equally small Antiphon, creating an intimate musical experience that was intelligent, friendly and accessible. A few readings from TS Elliott and Margaret Birks complemented the music well without distracting from the pace and momentum of the concert. I studied Bede for the whole of my first term at university, but last Saturday night he came alive for me as never before. Bede, played magnificently by Davy McCracken from Tarset, spoke to a sold out audience from the pulpit at Hexham Abbey. He narrated stories of Northumbrian saints and his narrative was continued and embellished by music written and performed by Northumbrian musicians. Performers and audience moved around Hexham Abbey under atmospheric lighting, much provided by candlelight. From the font to the high altar, north and south transepts came a creative and polished array of music. This was a magnificent collaboration between local choir Antiphon, local composers and musicians, visiting medieval duo Alva, Hexham Art Club and Hexham Abbey staff, particularly the Rev Joanna Anderson, Michael Haynes and John Arthur. Penned by Antiphon artistic director Judy Lloyd it was a bold vision in every respect, from the scale of new musical composition to the interweaving of music, art and drama, to the number of different performers involved and the innovative use of Hexham Abbey. Even the audience felt a part of the performance. We became almost monk-like ourselves in our quiet following of the music and stories under candlelight. The structure of the work interwove three themes: the story of medieval Christianity in Northumberland, the lives of Northumbria’s colourful saints and the building of Hexham Abbey itself. The players were costumed, which added to the sense of occasion. From Ethelburgh’s (Lucy Mair) lyrical pleading with Edwin, to charismatic Wilfrid (Andrew Turnbull) triumphing at the Synod of Whitby they played their parts well. Almost the entire musical score was written by local musicians - Judy Lloyd and John Roper of Antiphon, Director of Music at Hexham Abbey Michael Haynes, former Corbridge organist and Hexham Abbey choral scholar, Andrew Passmore, and Corbridge musician Philip Thicknes. The breadth and scale of the work was impressive. The instruments alone included an Irish whistle, medieval fiddle, cello, hurdy gurdy and Hexham Abbey’s organ. Yet the instrumentation always complemented and never overpowered the voices of the singers, soloists and chorus alike. Among the many musical highlights were a haunting duo of Iain Duncan (baritone) and Joey Oliver (Irish whistle), the joyous ballad of Hild performed by Alva, the children’s choir conducted by Sarah Robinson and the dramatic finale performed with gusto by Antiphon. The whole work took more than a year to bring together. It was given financial support from the Choral Ambition Scheme, funded by the BBC Performing Arts Fund – and ambitious it certainly was. It deserves to be heard and seen again, although the performers might not thank me for saying this. Many people will be having a well earned rest this week! For me, I came straight home to dig out my Bede and have already started re-reading it. In his closing words on Saturday night Bede offered his farewell to his Lord before sinking to his knees and asking the Lord to bless this church and its congregation. Yes, I thought. Bless this place. And bless the many talented people who compose and perform here. On a wet and miserable summer evening, my spirits were lifted by a sparkling performance of some of the most wonderful 20th century English choral music. The concert was given by the joint forces of Antiphon and Vox Humana to mark the half centenary of the death of Ralph Vaughan Williams. Held in St Mary's Church, Hexham, the first half of the concert featured the sublime Vaughan Williams's Mass in G minor, first performed by the City of Birmingham Choir in 1922. The conducting was shared between John Roper of Antiphon (which mainly performs early church music in Hexham and the Tyne Valley) and Andrew Soulsby of Vox Humana the Tyneside-based chamber choir which also specialise in early vocal music). The Mass is written for double choir, which was used to great effect as the music seemed to move atmospherically from one side of the church to the other, while the four soloists provided yet another level to the sound with a clarity and intensity that really did make the hairs on the back of my neck stand up! Most thrilling of all, though, were the passages where the entire group sang together, filling the church with sound and utilising to the full the excellent acoustics of St Mary's. The second half of the concert included pieces by some of Vaughan Williams' contemporaries, such as the incredibly moving (and tricky) Faire is the heaven by the organist and composer William Henry Harris. A setting of the Magnificat and Nunc Dimittis by Herbert Howells, who incidentally was inspired to become a composer on hearing the first performance of Vaughan Williams' Fantasia on a Theme by Thomas Tallis in 1910, was also on the programme. The concert ended with rousing rendition of Gustav Holst's inspirational setting of Psalm 148, Lord, who has made us for thine own, provoking a standing ovation! In the words of a friend and fellow audience member, I was "blown away" by the sheer beauty of the music, and the skill and sensitivity with which it was performed. Thomas Tomkins was an English composer who lived through the turmoil of the period before the Civil War with all its twists and turns. He suffered from the whims of fortune, and still produced some of the most fascinating work of this great period of English music. Antiphon, a regional amateur choir which specialises in this period of music, and which helps smaller churches which have no choir to keep up the traditions of church choral music, put together an intriguing programme built around Thomas Tomkins's work for the Hexham Abbey Festival. With a lively narration, semi-dramatised, to fill in the details of his career and his contemporaries, the music was skilfully directed by John Roper. When in full voice, singing all together, the choir produced a full-blooded sound which made a powerful impact. Antiphon are to be congratulated for tackling a formidable and ambitious programme with confidence and aplomb.